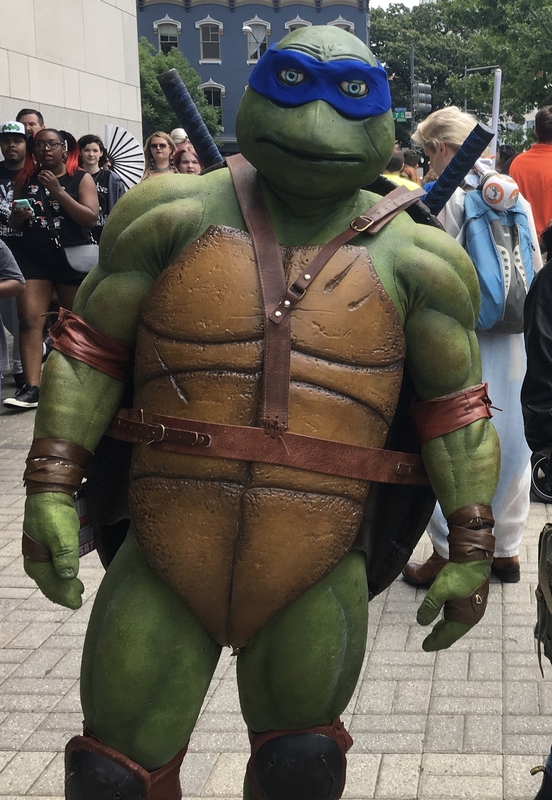 I recently finished this Leonardo costume and debuted it at Awesome Con. I entered the big costume contest and took home Best Craftsmanship and Best Portrayal! The costume was built largely based around Ted Haines' muscle suit tutorial, as the bulk of the suit is carved upholstery foam. 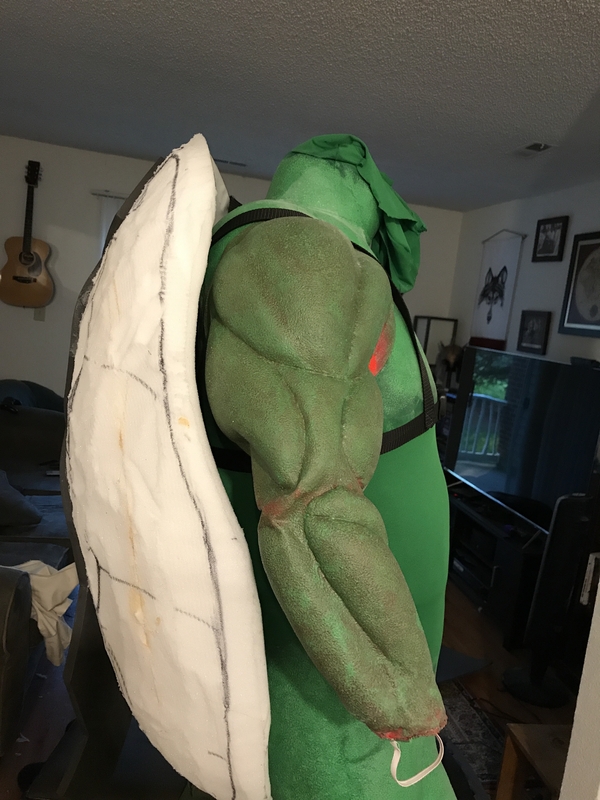 I followed his process pretty closely, but once the final "skin" layer was put on the muscle suit, I then applied liquid latex to cover seams and give some texture. 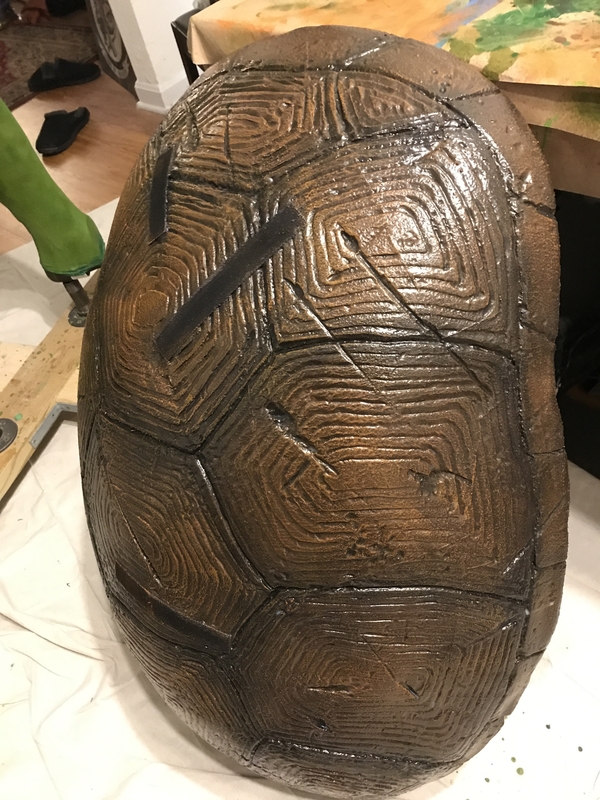 The front and back shells are EVA foam, and details were added with both a dremel and wood burning tool (super toxic I assume; mask and ventilation were essential). The mask and gloves were carved out of WED and monster clay respectively. The mask was cast in latex with a resin face shell to keep it's shape. The gloves were cast in foam latex. For the feet, I cut the toes off of some sneakers and inserted latex finger tips I cast from the hand molds. The swords were basic black polycarbonate swords I bought online and painted. This was a huge project for me and there was a lot I now know I could/should have done differently/better, but the whole thing was a worthwhile learning process; nearly every step was a first for me: muscle suit construction, EVA foam, sculpting, mold-making (side note: I HATE gypsum molds), casting in latex and foam latex, building a foam latex oven, even airbrushing; pretty much the only thing I had any previous knowledge of was weathering. This site has been a HUGE help and source of inspiration, so thank you! Close up of the shell. Velcro is to keep the belt straps in place. Taking a quick nap before the craftsmanship judging. Despite under armour, ice packs and even fans in the mask, the suit was HOT. Awesome work, that's a massive project! Congrats on the wins. Well done! Everything looks like it fit good. 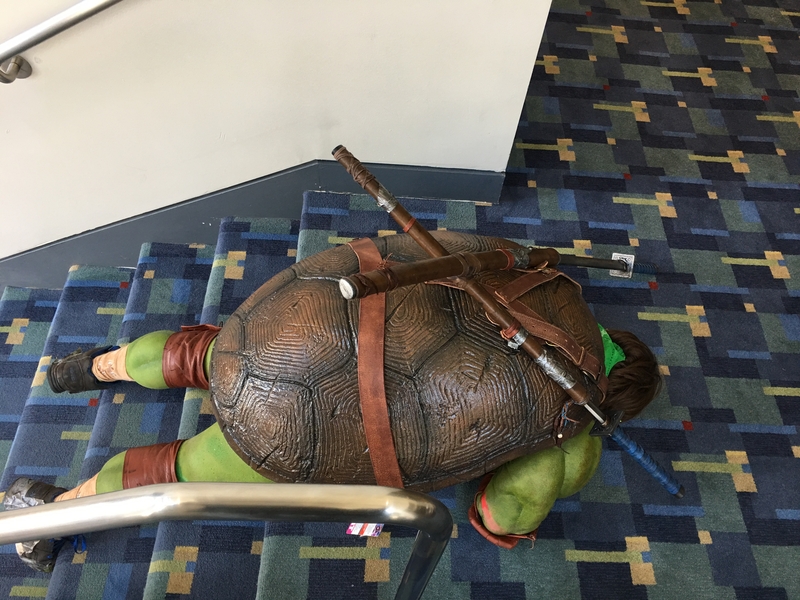 I have noticed a lot of turtle costumers have problems keeping the shell in place. IT either has loose straps or is secure. These pictures give no signs of those problems.